It is not very often that it is too hot to go walking in the Lake District but there have been days in the past few weeks when this has been so! The lakes however have looked very inviting and many people have been swimming. Some guests last week swam everyday and even I went for a dip on Sunday: it was lovely and the water was quite warm. Most of the sheep have now been shorn and no doubt they are very grateful to lose their thick fleeces. The long warm dry spell has been very good for the farmers hay making and there has been a constant hum of tractors well into the evenings. 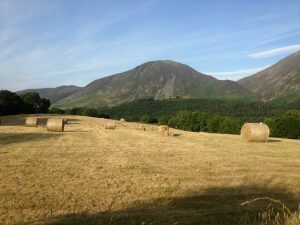 My sister, Margaret, and her husband were staying with me and Len took this lovely picture of a hayfield as we walked down to the Kirkstile one evening for a meal. Judy and I went over to Haweswater last week. It’s a long drive but it was worth it! 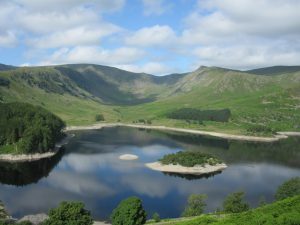 It is interesting that of all the reservoirs it is Haweswater and the drowned village of Mardale that captures the imagination. We went for a long walk on the fells on the far side of the lake: it is an interesting landscape, wild, open and remote but with a great sense of history, from its old Corpse Road and pony track to the remains of the towers and survey posts left from the development of the reservoir and aqueduct in the 1930s. It can also be very boggy but as it hadn’t rained for sometime our feet luckily remained dry. 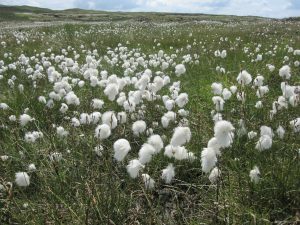 The cotton grass was magnificent, swathes of white stretching across the fell top and some of the individual heads were larger than I have ever seen! One of the pleasures of the warm spell has been to have breakfast outside in the garden, enjoying the sunshine, the birds and the view. It has also been lovely to take Wattie out in the peace and quiet of the early morning. I took this picture of Foulsyke from the boat house at Crummock earlier this week. 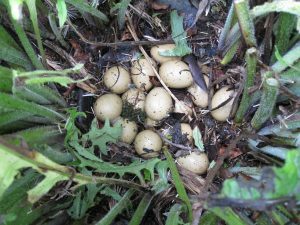 I was going to finish there but in between writing and posting I went out to do some gardening and found 16 pheasant eggs tucked into the base of my cirsium! I had noticed a pair of pheasants lurking there a while ago…… wonder if Peggy had anything to do with the abandonment?